This is the deck I have worked on the most, and the one that I enjoy playing the most. In my playgroup it makes me an automatic target now when bring it out, so its usually reserved for the last game of the evening. I may not always win now because of the instant hate, but in classic RED form, I will make sure I hurt everyone before I go down. 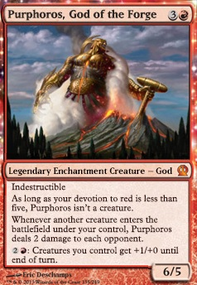 I have strived to build this deck in a way that I never have the devotion for Purphy to reach creature status. This allows for the most part for me to avoid problems like Darksteel Mutation , Ashes to Ashes or, Humility . Norin the Wary – depending on the players, I can do 8-10 damage every round with this guy and he is super hard to remove. Grinning Ignus – I can bounce this guy multiple times a turn to generate a lot of damage. I can also save him until next turn if I need a bump in mana. 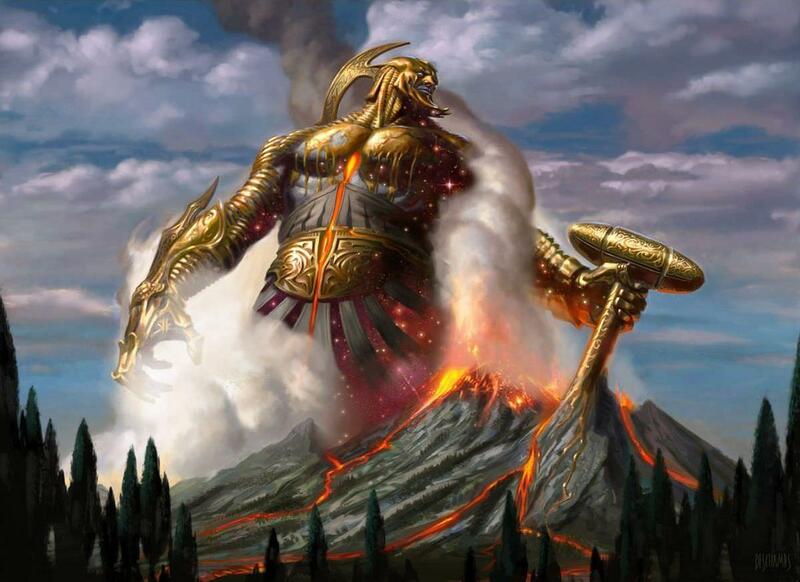 Neheb, the Eternal – after combat on the turn I play this guy I can usually play another card for free. Mogg Infestation – this has recently allowed me to hit all opponents for 20 damage. I am open to suggestions and welcome input. Below is a detailed list of all cards in this deck, and my reasoning behind adding them. Grinning Ignus - Bounceable creature for multiple ETB. Also works good for extra mana from one turn to another. Magus of the Wheel - I previously had Reforge the Soul but swapped out for this guy. Found that with all the extra card draw I couldn't depend on it's miracle cost. And at least Maggy damages everyone for 2 when he enters. Neheb, the Eternal - He costs 5 mana, but with 3 opponents he gives back 6 mana on the same turn after combat. Runaway Steam-Kin - I recently swapped out Squee, Goblin Nabob for this guy. 1 mana less casting cost, and the extra mana bump potential might work, we will see. Siege-Gang Commander - 5 Mana for 4 ETBs. Don’t usually use the sac ability. Squee, the Immortal - The Squee brothers are both great for blocking and recasting. A tad expensive for 1 ETB however. Tuktuk the Explorer - 3 mana for 2 eventual ETB effects. He also makes people think twice before attacking because they take damage. Wurmcoil Engine - 6 mana for 3 eventual ETB effects. He also makes people think twice before attacking because they take damage. Descent of the Dragons - 6 mana to swap all my 1/1 dorks for flying 4/4 dorks; and all the ETB effects that come with it. Molten Birth - 3 mana for 2 ETB, nice, but the ability to get it back and cast again is great. Wheel of Fortune - It may look like someone took sandpaper to it, but its still playable and great. Glacial Chasm - This has allowed me to live 5 more turns than I should have. Kher Keep - It doesn't often see action, but every once and a while, if I have a couple untapped lands, its good for an extra couple of damage. Spawning Bed - This is more of a late game Hail Mary. requires 6 untapped mana (plus the bed) to deal 6 damage to all opponents though ETBs. The good thing about the spawn though is that they can then be used as mana for further spells. Spinerock Knoll - Hideaway, I think I have managed to play the card under it every time I see it. Endless Atlas - A cheap way to get a bit of extra card draw. Howling Mine - By turn 7 I am generally top-decking. I figure with my lower casting curve, I can play 2 spells for every big beast my opponents play, so for me, it’s more of a rush to get cards in hand. Meekstone - When I play this deck the entire table starts attacking me, need to slow down the hate. And because my creatures either aren't big enough, or just don't tap, it's not really an issue for me. Sol Ring - ummm, it's a Sol Ring. Chaos Warp - One of the few ways I have to deal with enchantment removal. Enchanter's Bane - If someone does get out an enchantment that shuts my deck down, this at least is a way to kill them first. For me, building a new deck was always about figure out 93 cards; because Sol Ring , Darksteel Ingot , Evolving Wilds , Terramorphic Expanse , Swiftfoot Boots , and Lightning Greaves were automatics. I have gotten questions before about why I love fetch lands; even in a mono color deck, my argument has always been that fetching a land out of your deck effectively changes the mix in your remaining deck so that the next card you will pull has a greater chance of being a non-land. I have realized though, that this deck plays very differently than any other one I have. I want the game to end FAST, so the mix of my future deck shouldnt matter, I need land that can be tapped right away. I also realize that there are very few creatures worth protecting with the boots or the greaves; really only 2 Dragonmaster Outcast and Neheb, the Eternal , and nothing needs the haste to attack. Its not worth keeping 2 spots for cards that barely have a use (as much as I love both of them).